Lt. Gov. 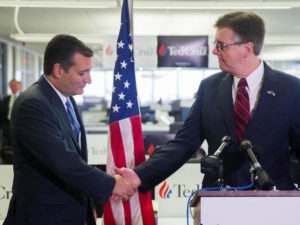 Dan Patrick and Sen. Ted Cruz in Houston. A clear-eyed assessment of the long-term strength and influence of the Tea Party in Texas – the actual movement, not Astroturf groups funded by a handful of wealthy contributors – is naturally reliant on the durability of the officeholders who credit those voters for their success at the ballot box. Lt. Gov. Dan Patrick, Sen. Ted Cruz, and to a lesser extent Gov. Greg Abbott all embrace self-identified Tea Party supporters and each has worked to promote the policies they want from government. Given that Gov. Abbott has largely been missing in action when it comes to the Republican Party of Texas’ current quandary, the race for the White House, Patrick and Cruz deserve a review of their performances. Patrick was on board with nominee Donald Trump from the moment Cruz was no longer an option. Cruz, not so much. These two statewide Republicans both won office principally by defeating the same man, former Lt. Gov. David Dewhurst, in GOP runoff elections with small electorates dominated by voters demanding politicians who will commit to “doing what they said they would do.” In considering which has the more durable career, the difference may well be that Patrick does what he said he would do while Cruz merely says what he said he would say. Cruz and Patrick, both Senators, entered their respective legislative chambers as protesters – the former aiming to defund Obamacare in DC and the latter on a mission to strip the Texas Senate of its longtime rule that two-thirds of senators had to agree before a bill could be brought to the floor. One of them, Patrick, eventually got his way but not before adapting to the environment. Texas Capitol observers will recall the spectacle of Senate Dean John Whitmire taking Patrick to school during his first legislative session back in 2007. Then-Sen. Patrick, at the last minute, unveiled to the media a list of cuts he would make to the budget. When he rose to talk about the list on the Senate floor, Whitmire accused the freshman senator and radio talk show host of being completely unserious about his proposals, leading to a shouting match with Patrick assuring Whitmire he meant every word. “It’s high time you show this body that you know what you’re taking about,” Whitmire said angrily. “I do know what I’m talking about and I don’t have to be lectured by you,” Patrick shot back. To re-live the fun, check out the video. In Washington, Sen. Cruz has done the opposite. After failing to defund the Affordable Care Act while arguably extending the recession via government shutdown, Cruz sought higher office by promising more of the same maneuvering and called his own party’s leader in the U.S. Senate a liar. Cruz embraced Trump during the opening months of the campaign for the presidency, hoping to gain the billionaire’s supporters after he eventually dropped out of the race. Trump just had to drop out, right? When that didn’t work out and Cruz was forced to concede defeat, he did not graciously endorse the nominee. That could be easily understood if not supported by those who until now have stuck with Cruz all along. Sen. Cruz’s change of heart in endorsing Trump altered the attitudes of many of the junior senator’s supporters. Two North Texas Tea Party activists, for example, expressed dismay on social media. If you’re not familiar with McComb and Openshaw, by the way, it’s because you haven’t run for office as a Republican in Dallas County or the surrounding area. These are actual grassroots activists who have block walked, made calls, written blogs, attended events, and sent emails to everyone they know to support Cruz and candidates aligned with him. Those Tea Party activists in the “Never Trump” camp were no doubt angered when Lt. Gov. Patrick told radio host Laura Ingraham it was time for Cruz to be a team player and endorse Trump. Days later, Cruz fell in line. As a senator, Patrick worked earnestly to gain the respect of his colleagues on both sides of the aisle. Only after he had significantly built his political capital did Patrick betray Senate leadership, vote against the budget with little explanation, then use his last-minute “no” vote as a centerpiece of his challenge to wrest the gavel from Dewhurst. Few at the Capitol took the former sportscaster seriously during his first session. Six years later in 2013, Democratic Sen. Royce West was calling him “The New Dan Patrick” on the Senate floor as the pair worked to craft education legislation. There was never a “New Ted Cruz” until the mighty oak that just wouldn’t bend finally broke under the pressure applied by Patrick and others to finally – if tacitly – get behind the party’s ticket for the Oval Office. A politician with Cruz’s skillset should be able to rehabilitate himself over the course of the next two years if he wants it badly enough. He’s already spending time crisscrossing Texas, reconnecting with voters. After ending his campaign for the presidency, Cruz immediately started holding roundtable discussions all over this state, including a first-ever-for-him talk with agriculture interests in West Texas. The fine folks in Lubbock appreciated it. Cruz’s time might be better spent, though, in Washington where he could try being a senator.